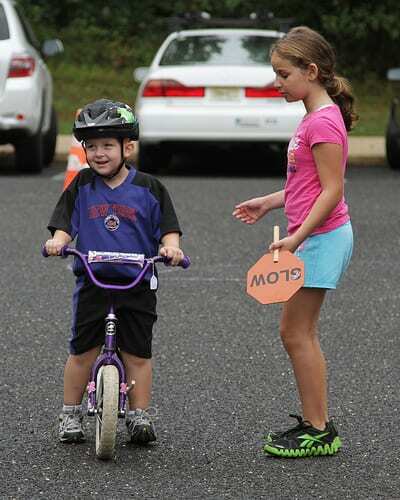 About 22 kids attended the West Windsor Bicycle and Pedestrian Alliance’s “learn to bike” class at the farmers’ market this month, and we are delighted that most learned to ride without training wheels that day. This was our third class for kids since we began holding sessions last spring, and we once again thank Bike New York for teaching us this simple method: remove training wheels and pedals, get kids scooting and lifting their feet off the ground until they master balance, reintroduce the pedals, show them how to start and stop, and let them start riding. 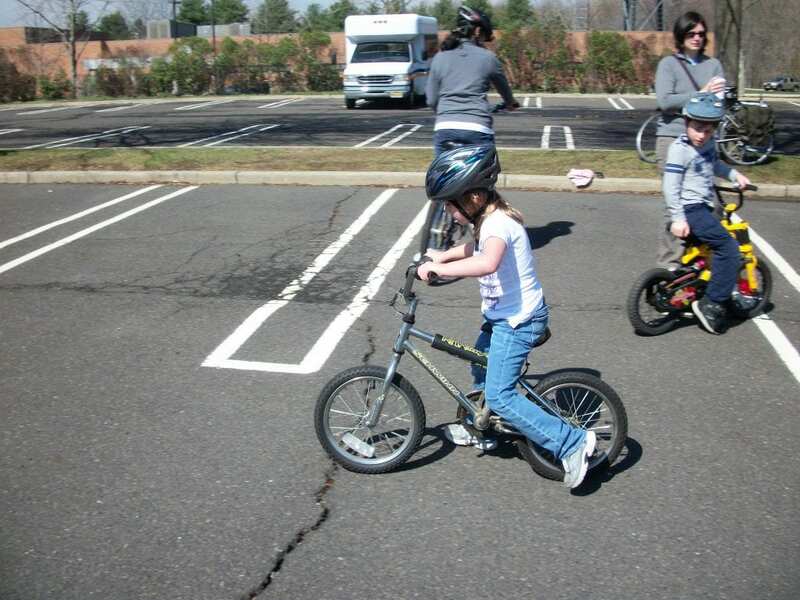 The West Windsor Bicycle and Pedestrian Alliance is holding its first “learn to bike” class of 2012 to get more kids off training wheels and enjoying the freedom of two wheels. 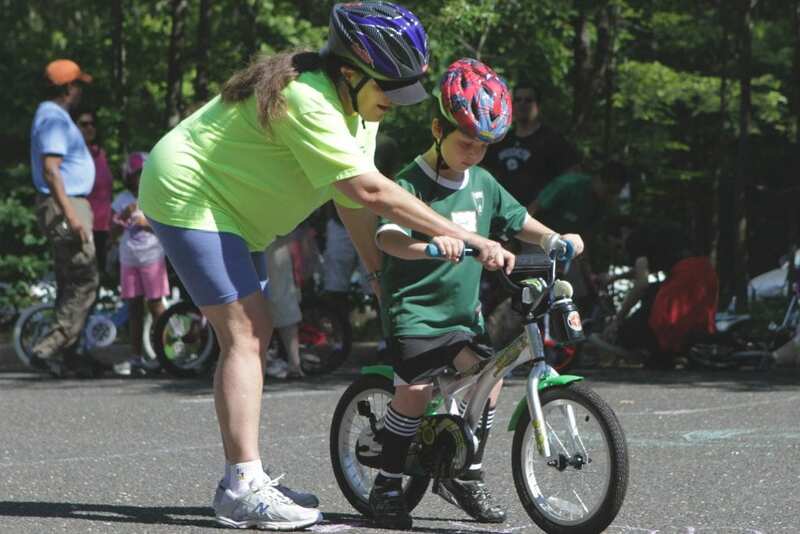 We use a safe and effective method that teaches kids to balance on their bikes without pedals or training wheels. 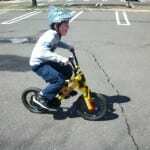 Then the pedals go back on and we review how to start and stop. No clutching the back of the seat! 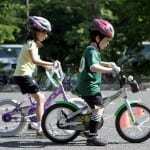 Children generally learn pretty quickly, though they may need more practice with mom and dad the next day. It works! We’ve already taught more than 700 kids. Watch the video from our first class! This session is being held at the West Windsor Farmers’ Market on June 16 and is being offered to WWBPA members only. Kids can begin arriving at 9.m. and stay as long as they like, until the market closes at 1 p.m. The market is held at the Vaughn Drive commuter parking lot. Not sure if your membership is current? You should have received an acknowledgment letter from us in the past year. Or ask, and we can check our records. 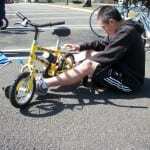 Preregistration via wwbikeped@gmail.com is required. 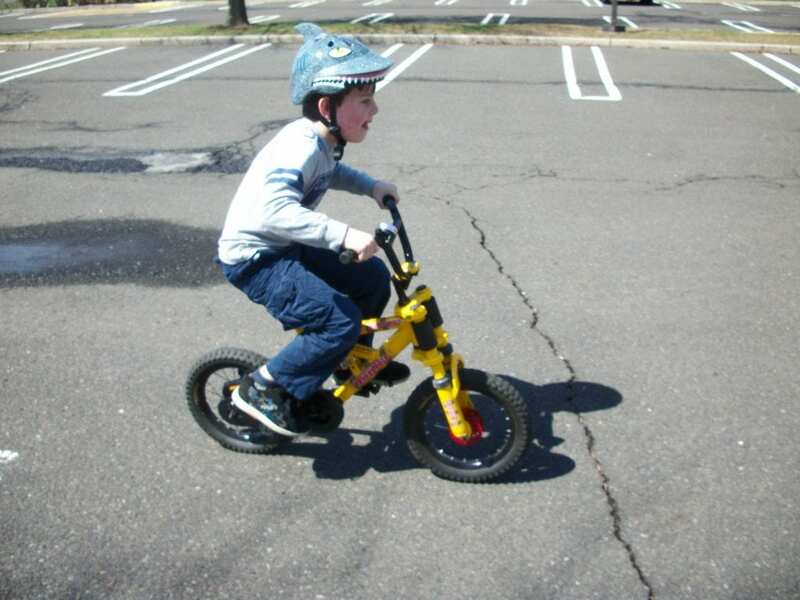 Bring a bike in good working order; kids should be able to touch the ground while seated. Helmets are required and can be purchased from the WWBPA for just $10. 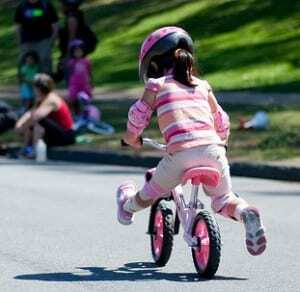 Not everyone learns to ride a bicycle as a child. But it’s never too late to learn and join your family on their outings. 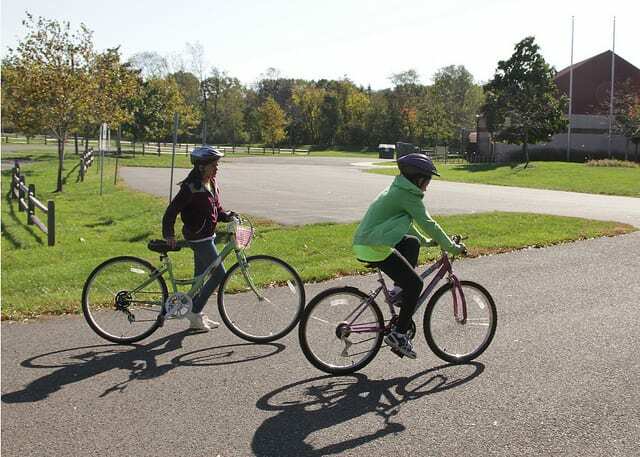 The West Windsor Bicycle and Pedestrian Alliance is holding a special “learn to bike” class for adults of all ages (as well as mature teens) on Sunday April 29. 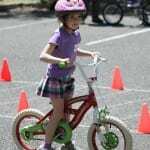 We will use the same pedal-free balance technique that works so well in our “learn to bike’ classes for children. 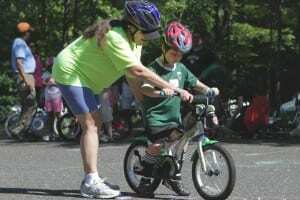 The class will be held between 10 a.m. and noon in the Vaughn Drive parking lot off Alexander Road (by the Princeton Junction train station) and is free. Just bring a bike and helmet. You must be able to rest your feet flat on the ground while sitting on the bicycle seat. 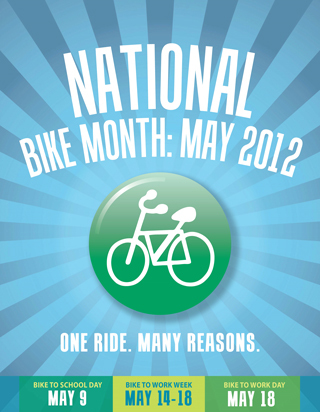 If you don’t have a bike, please tell us so we can make arrangements. No helmet? The WWBPA sells them for just $10. 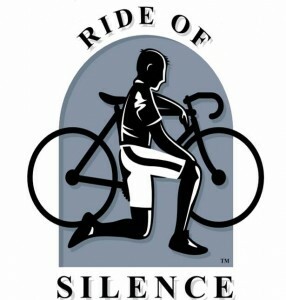 This is not a class for those who know how to bike but want to become more confident cyclists. 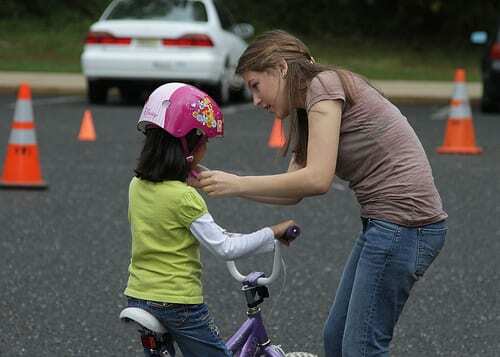 The West Windsor Recreation Department is offering a class for you in May called Traffic Skills 101. 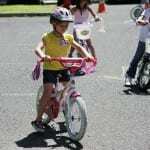 The WWBPA will offer a “learn to bike” class for kids in June. Watch for details. The West Windsor Bicycle and Pedestrian Alliance taught another 17 kids to bike without training wheels on Saturday by using a low-stress technique taught to us by Bike New York: take off the pedals and training wheels, lower the seat, learn to glide (and balance) and then put the pedals back on. It’s amazing to see how quickly some kids get it! And others just need a bit more time and encouragement. We think it helps that they see so many others doing the same thing. Did you see us at the farmers’ market? Check out our photos to see what it’s all about. Many thanks to all our volunteers! Want to join our crew next year? 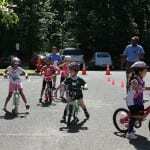 About 50 area kids, generally ages 5 to 7, learned to ride bicycles without training wheels at the West Windsor Farmers’ Market on Saturday , May 21, as they took part in a free “learn to bike” class with the West Windsor Bicycle and Pedestrian Alliance. 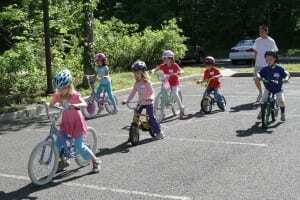 The class used a safe and effective method that teaches kids to first sit and “scoot” on their bike without pedals or training wheels until they learn how to balance. 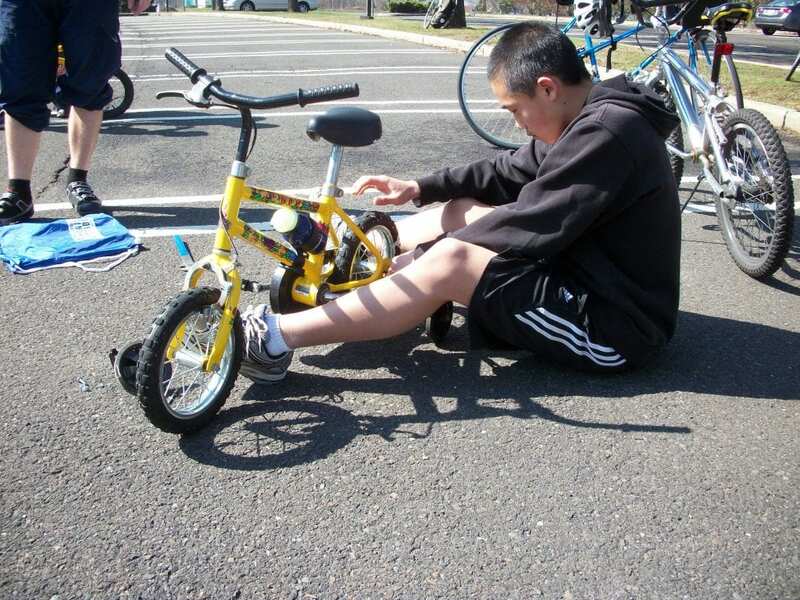 Pedals are then reattached, kids are taught how to start and stop and then, with a bit more practice, they are cycling without an adult needing to clutch the back of the seat. 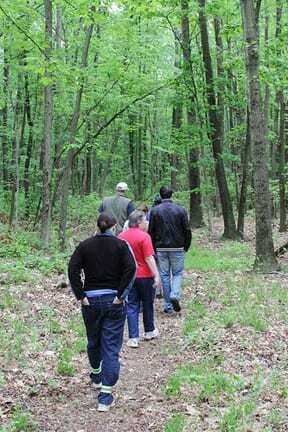 The method isn’t just for kids; the WWBPA also taught one adult on Saturday. The response from the community – West Windsor and beyond – was incredible and exceeded the WWBPA’s expectations. The feedback from parents who brought their children has been overwhelmingly positive, and the WWBPA will be discussing plans for a future event. 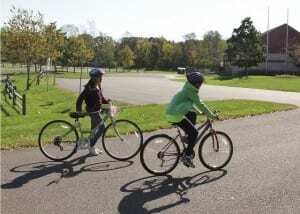 Many thanks to Bike Exchange, which supports the Boys and Girls Club of Trenton by selling good used bikes, for the use of loaner bikes. 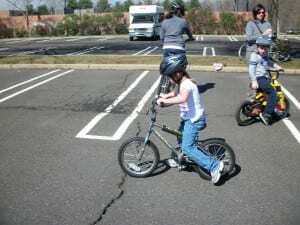 We learned that it’s much easier to learn balance on a small bike (easier to touch the ground solidly with your feet), and we swapped bikes many times. Now who left pedals behind?